A magnificent golden tapestry, more than 6 meters in width, ordered by Henry VIII in the 16th century, was discovered in Spain, long after it was thought to have been destroyed. Woven with shiny gold and silver threads and literally worth the royal estate, he once adorned the walls of Hampton Court, the mainstay of the Tudor monarchy. In exquisite details, his main stage depicts a bonfire in which St. Paul directs the burning of non-religious books. This was a harsh message from the King, who claimed his religious authority during the devastating phase of the English Reformation, a religious antecedent for the destruction of monasteries. Experts called it the "Holy Grail of Gobelins of the Tudor Court" and "one of the most luxurious and important Renaissance tapestries". He was part of a lost set of nine tapestries depicting the life of St. Paul. The kit was delivered to the king in the late 1530s and after his death in 1547 is mentioned in the property inventory of Hampton Court. After the repair of Windsor Castle in the 1670s, the tapestries were used again as directed by Charles II. Before disappearing, the last time they are mentioned in the records of Windsor Castle in 1770. Henry VIII was perhaps the greatest collector of tapestries in history, originally owning a collection of 2500 items. But to this day only a small percentage of them have survived, including one of the main masterpieces of that collection. 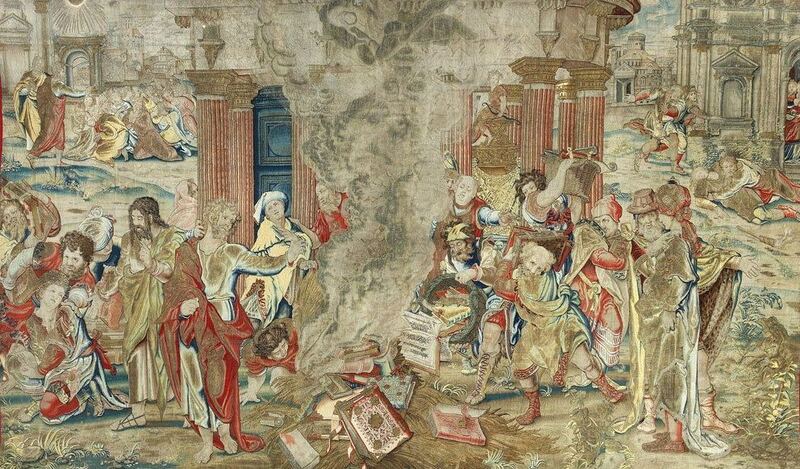 The tapestries of Abraham, found in Hampton Court, also belonged to Henry VIII. These are very refined, refined hand-held biblical tapestries, while the newly discovered pattern is very dynamic. Studies show that the Spanish dealer sold the tapestry to St. Paul collector in Barcelona in the 1960s, and later he was sold to an anonymous buyer in Madrid, who now sent him to the UK for cleaning and conservation. Leading experts on tapestries, Simon Frenses and Thomas Campbell confirmed that this is a subject from the collection of Henry VIII. Franks called it "the highest achievement of tapestry weaving". Tapestry designed for King Peter Cook van Alst. It was woven in Brussels, and its manufacture required, perhaps, up to two years of work of several of the best weavers of the time. Van Alst combined the drama of Raphael with the characters of Durer in amazing detail. The history of the royal collection of tapestries is lost in the 18th century, when paintings began to eclipse tapestries in popularity and gradually take their places. Perhaps the royal servants were trying to dissolve the owners of tapestries that had lost their interest in order to extract a gold thread from them. In 2013, the Spanish owner of the discovered tapestry suspected a possible connection with Hampton Court and tried in vain to obtain a license for export. Now the study has firmly established a connection. Frances called on Spain to grant an export permit. He hopes that Britain will be able to purchase this item if it appears on the open market. Tapestry is estimated, at least, 5 million pounds sterling.